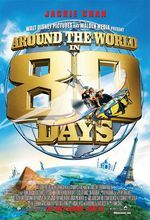 Loose adaptation of the Jules Verne novel of the same name follows the adventures of a curious British adventurer and his bid to circle the globe in eighty days. A Chinese man robs the Victorian-era Bank of England, taking the alias "Passepartout" and latching onto eccentric London inventor Phileas Fogg, an intrepid adventurer attempting to win a bet made with fellow patrons of his gentleman's club that he can circle the world in eighty days. No mode of transportation is off limits as Phileas and his martial arts-practicing pal battle weather, investigators eager to implicate Phileas in the bank robbery, and a number of other obstacles along their journey.